1Jim Molan replaced Fiona Nash on 22 December 2017 following the High Court ruling that Fiona Nash was ineligible to sit. 2Kristina Keneally replaced Sam Dastyari on 14 February 2018 following Sam Dastyari’s resignation. 3Mehreen Faruqi replaced Lee Rhiannon on 15 August 2018 following Lee Rhiannon’s resignation. 4Brian Burston resigned from One Nation in May 2018, and then joined Clive Palmer’s United Australia Party on 18 June 2018. 5Duncan Spender replaced David Leyonhjelm on 20 March 2019 following David Leyonhjelm’s resignation to run for the NSW Legislative Council. Dating back to 1951, when the Senate for the first time was entirely made up of Senators elected by proportional representation, Senate representation from New South Wales has been relatively stable. Up until 1958 the numbers remained steady with 5 ALP senators, 4 Liberal senators and 1 Country Party senator. 1958 saw the Country Party win a seat off the ALP, giving the Coalition a 6-4 majority amongst NSW senators. The ALP gained two seats in 1961, giving them a 6-4 majority. The Country Party recovered a second seat in 1964, restoring an even balance of ALP and Coalition senators. In 1970, the sitting Country Party senator was defeated, as was the Country Party senator who had filled a casual vacancy, meaning that the party lost both its seats, while the Democratic Labor Party won a NSW senate seat for the only time. The result produced a 6-4 majority for the ALP over the right-wing parties. The 1974 double dissolution restored the 5-4-1 balance between the Labor, Liberal and Country Party, which was maintained in 1975. 1977 saw the ALP lose one of its five senate seats to the Australian Democrats. This 4-4-1-1 balance was maintained in 1980. The 1983 double dissolution saw the Liberal Party lose a seat to the ALP, seeing five ALP senators, three Liberals, and one senator each for the Democrats and National Country Party. This result produced a 6-4 majority for parties of the left for the first time 1970. The ALP and Democrats collectively maintained a majority in the NSW senate delegation for the entirety of the Labor government. The 1984 election saw the Senate’s size increased, with New South Wales gaining an eleventh and twelfth senator. The Democrats and the National Country Party each maintained a single senator whilst the ALP gained a sixth and the Liberals a fourth. The 1987 double dissolution saw the ALP lose its sixth senator to the Nuclear Disarmament Party. 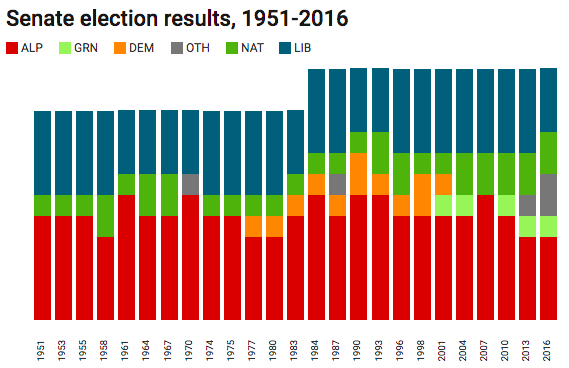 The 1990 election saw the ALP and Democrats each gain a senator, at the expense of the Liberals and NDP, producing a result of 6 ALP, 3 Liberals, 2 Democrats, 1 National. This gave the ALP and Democrats an 8-4 majority. In 1993 the Democrats lost a seat, with the Nationals gaining a second senator in NSW for the first time since 1970. In 1996, the ALP lost a senate seat to the Liberals, producing an even split between the ALP and Democrats and the Coalition. The left gained a majority again, however, in 1998, when the Nationals lost a senator to the Democrats. In 2001, Democrat Vickie Bourne was defeated by Greens candidate Kerry Nettle, maintaining a 7-5 left-right split. The last Democrat, Aden Ridgeway, was defeated in 2004, replaced by Nationals candidate Fiona Nash, restoring a 6-6 split between the ALP and Greens and the Coalition. The 2007 election saw the ALP win a sixth senate seat at the expense of the Greens. This was the first election since 1975 to result with NSW having no minor party senators, with a 6-6 split between the ALP and the Coalition. In 2010, the Greens won back a single Greens seat, with former state MP Lee Rhiannon moving to the Senate. The ALP lost one of their three seats to the Greens, while the Liberal Party maintained their three seats. In 2013, the Coalition maintained their three seats, while Labor lost their third seat to the Liberal Democrats’ David Leyonhjelm. The LDP benefited from a massive donkey vote thanks to a good ballot position on an extremely large ballot, polling 9.5%. Labor was reduced to four NSW senators for the first time since the Senate was expanded. The 2016 double dissolution only produced one change in the party balance. Labor maintained four seats, while the Greens and the Liberal Democrats held on to their single seats. The Coalition lost one of their six seats, which went to One Nation. Eight seats were won on primary votes – Labor and Coalition each won four seats. The Greens’ Lee Rhiannon came very close to a quota, and passed a quota when lead Arts Party candidate Barry Kerdoulis was excluded, with twenty-two candidates still in the count. Hall was excluded, and the other three candidates were elected. Most major party senators elected in New South Wales in 2016 are not up for election until 2022. The remaining senators include the incumbents from One Nation, the LDP and the Greens, along with only one Labor senator and two Coalition senators. You would expect that Labor would regain a second seat, possibly at the expense of the Greens, but more likely at the expense of a conservative candidate. The Greens failed to win a seat in 2013 and would have been very close to losing in 2016 if there were only six seats up for election. They still have a decent chance at winning a seat. If they don’t, it’s conceivable Labor could win three (an increase of two). The Greens have replaced their incumbent senator Lee Rhiannon with state MP Mehreen Faruqi, who could inject a different dynamic into the Greens campaign. You would expect Burston, One Nation and the Coalition to be competing for the third right-wing seat. With One Nation falling apart I’m expecting Leyonhjelm may have an easier time retaining his seat. I’m also expecting Labor to pick a seat off the Greens. Leyonhjelm won’t get re-elected, as the senate reforms mean the ballot paper will continue to shrink over time. The Liberals will be desperate to get a 3rd seat and I expect them to be very vigilant with how to vote cards specifically designed to avoid voter confusion. I doubt Burston will still be in One Nation by the time the election comes up, and I don’t think the brand will be strong enough outside of Queensland to get anyone running for PHON elected either way. I disagree Ben, I don’t see Labor out-primarying the Greens by the required 2 quotas to exclude them (I don’t think Labor would gain vs Greens on left micro preference flow). This will be your standard 3 left-3 right split. The left will be 2 ALP and 1 Green, the right will be 2 Lib/Nat and 1 wildcard, most likely to be another Lib but ON is possible. I don’t think Leyonhjelm could possibly get up unless he has incredible luck once again (2013 excellent position on a tablecloth ballot and then 2016 full senate election reducing the quota to 7.7%). The ALP would only need a swing of about 4-5% to outpoll the Greens for the third seat on primary votes. Quite plausible in current circumstances. Leyonhjelm, Shooters or PHON would have won the last seat under the old system, but in the new system I could imagine their votes not flowing to each other well enough. Could easily be a third seat for a major party. -Barring a record collapse, ALP will gain a second seat. -The Coalition will retain its seats, also barring a record collapse. -How the Greens will fare depends on their performance relative to the ALP. Assuming their support stays roughly where it is, they should keep their seat if the ALP polls below 34% on primary vote, will lose it if the ALP polls at 36% or above, and will be a toss-up if the ALP is between 34% and 36%. If their vote drops, the ALP can win on a lower primary vote; if it increases, the ALP will be far less likely to get their third. -The minor parties will clearly lose one seat. What happens to the other depends on the Coalition’s performance. If they stay roughly at their current level, the Coalition gains a third seat. If the Coalition plunges, it depends on both the depth of the plunge and if any group can consolidate (which, in terms of NSW, doesn’t seem likely). If the Coalition gains, the question is moot. -For a good hunk of this, it would be best to wait for the state election results for the Legislative Council (assuming the state election is before the federal one), as it will be more telling concerning the state of the minor parties relative to one another. Daniel what are you on about? Payne and Sinodinos are not up for re-election, neither is Keneally. One point of interest emerging is will the Nationals run on a split ticket? Strategically it would make sense for the Coalition. Split ticket would considerably improve their chances at winning 3 seats. Actually if they call a double dissolution if the requirements are met, They can call one, But it has to be at a certain time. There’s no trigger for a double dissolution, it’s too late to manufacture one, and it’s sheer madness to call one if you are trailing in the polls. It’ll be a half senate election. There won’t be a double dissolution. I don’t even think they have the triggers available? Why would they do that? They don’t need to do it for timing, and it would be much better for the minor parties while there’s a lot more Lib senators not up for election. My understanding is that Jim Molan will be first on a joint coalition ticket, with another Liberal (Andrew Bragg possibly?) second followed by the Nationals candidate third. Yeah I’d heard the same Ben, but surely if they give Nats 3rd position the Nats will just run in their own right! I just don’t see the Greens winning a Senate seat in NSW at this election unless they substantially increase their vote. At the last half-Senate election in NSW in ’13, they failed to win a seat, and Rhiannon would have likely been defeated had 2016 been a half-Senate election. All polling numbers are lower house primary vote though so it’s a bit tricky to estimate the senate vote. Currently in NSW they are polling +1.5% from what they achieved in 2016, which would imply a senate primary vote of ~8.9% which under the new preference rules is quite a strong starting point. Father Rod Bower says he is running as an independent which is could be a forlorn hope in the largest state in Australia, massive campaign required up get him up. I reckon he’d be best served registering a party, for example “Christians for refugees” or something. As an ungrouped candidate he’d stand no chance at all. I doubt he could get in ahead of 2 ALP and 1 Green senator, but it would be interesting to see if he can colonise some wet Liberal vote (that Kerryn Phelps showed was open to voting on refugee issues) and some CDP vote that is voting for the word “Christian” to make this into a “4 left, 2 right” state, he’d need maybe ~5% of the vote and then strong flows from Labor voters, and for the right wing minor party voters (LDP, PHON, UAP, AC, CDP) to fail to be disciplined in feeding each-other with preferences. Lee Brown (“Rhiannon”) is always good for a laugh, claiming that “tens of thousands” belonging to the CPA in the forties and fifties is significant (um, no, not in a country with a population of millions), or that her parents and others who joined socialist and communist parties during the Cold War were altruists (um, no, they knowingly ignored the oppression and atrocities of the Communist bloc). Paul, it’s disgusting isn’t it. Those of us who are descendants of people that fleed Cold War era Eastern European Communism will never forget the atrocities. I’ve aggregated historical senators by party to give a national view and forecast to 2022. I’m assuming that Clive Palmer’s United Australia Party will get 5 senators in 2019, increasing to 11 in 2022. The Chance of Palmer getting a single Senator are remote but the chance of him getting 5 in 2019 is an absolute impossibility. Burston will not get Pauline Hanson Preferences. She has shown a great ability to retaliate against those who stand up to her. In fact she reminds me of the old hatred of ALP members hatred for DLP. Burston will have no party structure to support him. The chances of him being able to put a How to Vote in 2% of electorate’s hands are extremely remote. There are about 2500 polling stations in NSW it requires skilled decentralised logistics to man these. With 2 Weeks of prepoll and Election day this works out at about 38,200 Hours of manning booths (based on 1 person per booth) or about $750,000 based on $20 per hour per person. Clive Palmer may be able to man Herbert but his pockets will not stretch to three quarters of a million dollars. When PUP stood in 2015?? Qld state election his workers spent most of the Day at Gympie High School sleeping under a tree. In 50 odd years manning election booths I have never seen any other party workers behave as lazily as this group. A Party structure can not be bought. It needs a commitment which $20 per hour casual employment does not buy. Palmer can put up Bill boards, pay for TV time but he can not logistically run a campaign without party branches which will never exist. HE can attract candidates with money but not experienced committed candidates. It is even more difficult to attract committed campaign managers and booth Captains. MY prediction is that Palmer is heading for a complete wipe out this time. 2 Major Parties have no problems, Greens have branches, Family First out sourced to AOG Churches, but let me assure you all other parties have great difficulty with some branch structure. Strategic Management can be bought but tactical management is nearly impossible to obtain. LOcAl business men just do not have the time. In recent Longman By election AUstralian Country Party managed to man most booths but key individuals were exhausted at end of campaign. There were three very experienced campaigners in this campaign and we just managed it. With Fly in Fly Out candidates you get PUP results and PUP loyalty once elected. United Australia Party has no Branch structure. Conflict will occur within hours of an issue coming up and no Conflict Resolution Procedure or long term party loyalty is a recipe for Party disintegration. Palmer by using the power of the purse string keeps some control but eventually pressure build up leading to BRanch and/ or total Party disintegration. One only has to look at current Liberal ideological divide to see the potential for a 1955 style Party Split and full scale Party disintefgration wityhin a few years. This type of divide will split minor parties such as UAP much more quickly. Palmer has had along history of party involvement but has not had much experience in political campaign tactical volunteer man management. Even the experienced have melt downs and difficulties. When running a campaign in Longman we had to print How TO Votes on morning of first day of pre poll and did not get Party HTV till half way though pre poll. I would suggest you don’t ebt yourt hopuse on your prediction. If BUrston somehow manages to wins he will need to establish a Party Branch every three weeks to have one branch in each NSW Division for following election. Let me assure you this is very unlikely to occur. My prediction 95% of Palmer money spent in Herbert and result is Zero Senators amnd probably defeat in Herbert. I see this returning to a 3:3 Right:Left Split (from what is currently a 4:2 Right:Left Split). The Coalition will pick up one seat (either one of PHON or LDP) and I see Labor wiping the Greens out for good in NSW, as their civil war continues. I then see Labor picking up the crumbs of what is left over for the 3rd Seat. Even in the case of Lee Singh (who was running in a state with a much stronger tradition of below-the-line voting, and in a situation where a much small percentage of the vote was needed ), she won at the expense of the fifth Labor candidate- the first three won easily on above-the-line votes. For Hughes to lose, a remarkably small number of voters would have to vote above-the-line for the Coalition, especially given how fractured the micro-parties of the right are likely to be, and I don’t see that as remotely plausible. If Palmer could only win three in 2013 (with preference-whispering to aid him to boot), what chance has he of five in 2019? South Australia doesn’t have much patience for his kind of politics, Lambie and Hinch are going to claim the same vote in Tasmania and Victoria, One Nation is an obstacle in Queensland, and Palmer’s reversals in the mining industry have cost him most of his Western Australia support. I hate to be blunt, but there is a 0% chance Molan wins instead of Hughes. Daniel is wrong above, too – since the introduction of proportional representation, no one outside Tasmania has ever won from a lower position on the ticket. If Molan were to have any chance, it would be by getting ahead of the Nationals’ candidate in third. But that probably wouldn’t help, since the Coalition is not winning three seats in NSW at the next election. And even in Tasmania, Lisa Singh (who has a much higher profile than Molan) would not have won in a half-Senate election (although her below-the-line candidate may have helped Labor win three – they would not have won five seats without her in 2016). As for Palmer getting 11 senators by 2022, please. Jim Molan is 68 and a rightist. He was only an accidental Senator when another Senator has to leave parliament. Good to see a women in the 1st place on the NSW Senate ticket. In Australia general retire from the Army NLT aged 60. Just fade away into retirement Jim. David Leyonhjelm is going to lose, Because of this Sexism thing going on in the senate lately, I really think he will lose, The only way he would survive is if a double dissolution happend, But because it wont he will fall, Voters wont take the sexism thing well. Here’s where NSW stands on current polling: Labor 2.74 quotas, Liberals 2.55, Greens 0.69, One Nation 0.42, others combined 0.6. Item 0: the usual 2 Labor, 2 Coalition setup applies. The Left and Right between them have enough for a third seat each, the question is just who gets it. Item 1: Leyonhjelm is done on this measure, unless there’s a polling fail and the LDP are most of the Others vote. The LDP managed about 3% in primaries last time, and 4.7% on five-party-preferred. (One Nation got 4.1% and 7.1% respectively.) I’ll give Leyonhjelm the benefit of the doubt and 0.35 quotas, a slight boost but not enough. Item 2: One Nation are looking stronger at this point, probably by virtue of actually having been relevant for several years in a row. Item 3: Where that Others vote goes is actually crucial to determining the final two seats. We should expect a percent or two to end up with the Greens, who actually managed 10.5% on 5PP last time. That should put them level with or even ahead of Labor, on about 0.75 quotas (because Labor tends to underperform its Reps primary in the Senate even on an N-party-preferred basis). Item 4: about 3.6% of the population didn’t preference any of the five winning parties last time. We can pretty much expect them to exhaust straight away, which is actually very helpful in simplifying analysis. From there we can simply look at remainders. LDP is the first to go. The big gainers are the Coalition, moving up also to about 0.75 quotas, but everyone else moves up a bit too. Labor and the Greens gain a little (Labor gains more), and One Nation doesn’t get enough to close the gap. Knock out One Nation; the Coalition (presumably the National, specifically) takes the lead, while Labor increases its margin over the Greens. Endgame, Mehreen Faruqi comes unlucky 7th. It’s 2016 all over again! In conclusion, small changes in the Left/Right split don’t make a difference here, they both have about half of the excess. What matters is the relative allocation. If the Greens can get an extra, oh, 2%, they’ll be home (provided Labor don’t do any better). If not, maybe not. Daniel, Leyonhjelm won’t be running for Senate in 2019. He’s running for the NSW upper house. With fixed election dates Leonhjelm can time his resignation so that his attempt at NSW upper house does not come into conflict with S44. If he loses in NSW election LD can re-appoint him to the Senate. JimMolan could probably win if he stood but my inclination is to think he will not stand against Liberal Party. Military life results in a reluctance to mutiny. Therefore I expect Molan to just fade away. Doug Cameron performing very well for Shorten’s Industrial Relations election. Heard him in Senate other day talking about workplace health and safety. He sounded like a true Labor man. I disagree with him but he would be a dangerous adversary if it was not for his accent. If he had been sent to elocution lessons by ALP ten years ago he would probably now be Leader of Opposition. The Greens appear to be on a decline nationwide (with exception of the inner city “Zone of transition” ( transitioning from working class residential through Brothels, Bordellos, CPA bookshopsand ultimately to unit dwellings inhabited by DINK households with no strong family ties) therefore Lee Rhiannon’s replacement may not hold seat. Shorten’s campaign strategy will go down well in Outer suburbs and some provincial areas but will be a Clanger within the Zone of Transition so flow of Green preferences will not be as strong to ALP as previously has been the case. Similarly flow of Conservative minor preferences to Liberal parties will be weaker. This is why election will be won or lost in outer suburbs. Lindsay will be more important than Wentworth in both House and Senate. With respect, I disagree that Green outgoing preferences will be much impacted by Shorten’s outer-suburbs campaigning strategy. Turnbull was relatively appealing; Morrison is not. I think this factor will outweigh anything else. Besides, in inner Sydney the ALP have Albanese and Plibersek to prop up their progressive credentials regardless of what positions Shorten takes elsewhere. Turnbull May have been appealing in inner suburbia but the bloke with a wife a couple of kids and a mortgage could see through him. Greens hardly manned Longman booths and even then used drive in drive out workers rather than locals. DIDO workers will concentrate on area of Green strength meaning Greens will not have manpower to staff booths in outer suburbs. Inner city Divisions make up about 5% of voters and even with A very high primary Vote half of 5% = 2 1/2%. In effect the influence of Greens will decline. Green preferences have no where to go other than to ALP. No one knows where my preferences will go because I do not know myself. Lee Rhiannon is a great asset to those of us who rank Greens a threat. Her family past and overt socialist agenda is much easier to fight than koala defenders or tree huggers who I may even agree with in some cases but who I have to oppose because of their covert support for other issues. I collated Greens/Labor/Coalition three-candidate-preferreds for the 97 seats where that made sense in 2016. The AEC publish Labor vs Coalition 2PPs for all seats, so I was able to infer what percentage of Greens-3CP voters then preferenced Labor (as the Greens HTV usually tells you to do). Then I graphed those two quantities against each other. You get a rather noisy knee-shaped curve – the follow rate seemingly drops off at low 3CPs, but also hovers around 85% even for very strong Greens seats. As far as outliers go… There’s 6 seats with a Greens-to-Labor flow rate of less than 70% (being Aston, Calare, Farrer, Fowler, Mallee, Parkes & Riverina). There were also 6 seats with a Greens 3CP above 25% (being Batman, Grayndler, Higgins, Melbourne, Melb Ports & Wills). Leaving off the outliers gives a very rough trend. Eyeballing it, the follow rate is about 85% at the high end and about 75% at the low end, which means the follow rate goes up by about 2/3 of a percent, for every percent the 3CP goes up. Longman, of course, isn’t in this analysis, because the Greens didn’t make the top three there. I can’t assess what the eventual 2PP split was from Greens *four*-party-preferred voters, but I do know about 80% of Greens primary voters there preferred the ALP. In conclusion, Greens 3CP voters preference Labor 70% of the time or higher in at least 60% of the seats, and Labor’s percentage tends to increase as the Greens 3CP does. What percentage will the Libreal Democrats get? 3%? Interesting analysis. In effect you are saying that about 1/3 of Greens voters go Liberal. However Green HTV either go no where or go ALP. My feeling is that Green HTV are handed out as promotional activity rather than as a means of directing preference flows. In this respect they behave like the major parties who in at least 110/125 seats do not care where their preferences go. Senate is a bit different. My estimate for Longman was that about 85% of Green Preferences flowed to Susan Lamb ahead of Ruthenberg (Lib) but I do not have scruiteneer figures to back this up. After 15 days out in the Sun on my feet I just took the view that scrutineers has was a waste of my time. AEC officials in my experience are scrupulously Fair in counting even if officious Martinets during the vote. Greens did not effectively man booths in Longman by-election They obviously think that HTV are a waste of time and or paper. No, only about 1/5 to 1/4 of Greens voters go Liberal (for average Greens voteshares). If you got the 1/3 figure from my 2/3 figure, I was trying to relate HTV follow rates to Greens campaigning strength – and that graph is decidedly not a straight line! The 2/3 figure represents a deceleration. At a guess I’d say there’s a core of about 10% to 15% of Greens voters who just Will Never Vote (preference) Labor. Meanwhile if the Greens can barely campaign at all in a division, I would expect their 2PP flow to Labor to be somewhere up of 50%, but beyond that it’s too variable. Interestingly Barnaby Joyce has called for the NATS in the Australian Financial Review to go it alone and separate from the coalition ticket and run their own ticket in NSW at the next federal election. He suggests their canidate Perin Davey has no chance on Senate spot no. 3 in the coalition ticket. It’s a worrying sign for them considering threats such as David Leyonhjelm has quit to go to state politics and Brian Burston has had a fall out with One Nation and has joined UAP which won’t have much traction in NSW. Since the introduction of candidate grouping in the Senate in 1922, no candidate has ever been elected on the mainland ahead of someone further up their group. Similarly, no candidate has even been elected on the mainland from the ungrouped column, although one candidate, Jack Lang, came within 2.8% in 1951 (a Double Dissolution election) and was only defeated by the Communist Party preferencing against him but might have done better heading a group. Tasmania has elected Senators from lower positions ahead of higher ones but it has a state lower house system (Hare-Clark) where voters chose from between party candidates and far fewer House of Reps seats and so far more media space and attention to devote to the Senate. It is also near impossible get enough preferences under the new above the line preferencing system because it advantages the group order and so the candidate(s) further up in the group (without at or near their own quota) have to get a very low post surplus distribution vote to not overtake a high below the line vote candidate further down the list. Molan is toast, save for further section 44 issues after the next election. Does anyone know when the ALP have to release all their senate tickets? The ALP have to release their Senate tickets (to the AEC, who would then) by the close of ticket and registered party name nominations in the relevant state/territory (noon on date to be specified when the relevant writs are issued).